The top communities on Money‘s Best Places to Live 2015 are not the wealthiest suburbs but they are fairly wealthy compared to national incomes. Only 7 have median household incomes less than $70,000 (the lowest is $57k) and 17 have median household incomes over $100,000. The median household income for the entire United States? $53,046 (data from 2009-2013). In other words, the methods ensured that these communities couldn’t be too poor or too wealthy. Yet, the above-average incomes in these communities are connected to all sorts of other factors: not just jobs but higher-paying jobs (likely white collar), the money available in the tax base, the education level of residents, the kinds of available housing, and so on. Could the average American live in these communities? 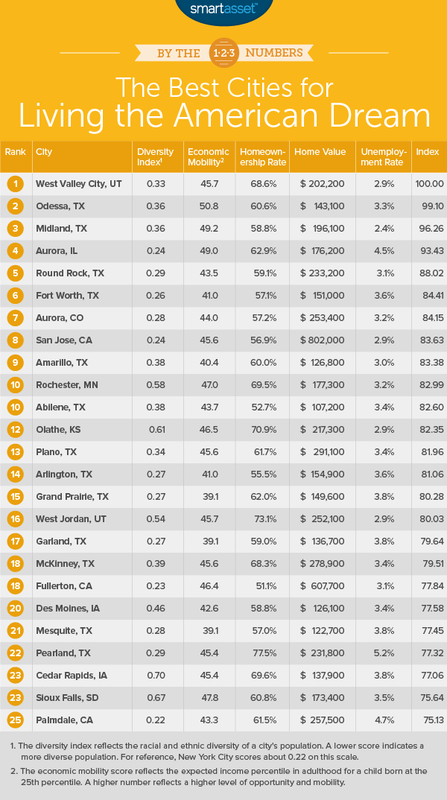 Perhaps there would be some cheaper housing (that is a factor in these rankings though it is primarily about cost and not about having apartments and smaller and/or older houses) and the median household income suggests half of residents in these communities are below the figures posted here. However, these rankings are geared toward people of higher social classes. As the culmination to our series on diversity studies, this final installment combines our previous reports on economic class diversity, ethno-racial and linguistic diversity, and diversified economies with household diversity to paint the clearest image of America’s cities today. Recognizing that economic opportunity follows diversity, where in the U.S. would you rather live? Better yet, where would your unique background be most valuable to society? To help you answer those questions, WalletHub once again examined the demographic profiles of the 230 most populated U.S. cities. In order to construct our final rankings, we tallied each city’s scores in the four major diversity categories we analyzed in this series. Los Angeles leads the way at #1 and Chicago is at #32 overall. For the record, Naperville ranks 125 in income diversity, 336 in educational diversity, 265 in racial & ethnic diversity, 170 in language diversity, 149 in region of birth, and 183 in industry diversity. Naperville is also listed as one of the five lowest in marital status diversity as well as in household type diversity. The commentary on the rankings suggests that economic opportunity is linked to higher levels of diversity. This may be the case but it doesn’t necessarily mean that the economic opportunities are equitably spread across cities. Perhaps having opportunities nearby is better than no opportunities at all – though I’m reminded of some of the earliest American sociological neighborhood studies like The Gold Coast and the Slum that noted how closely the rich and poor could live near each other with no interaction. Even if Naperville is not diverse in many of these areas, that doesn’t mean that it can’t be wealthier or that it won’t be viewed as a desirable place to live (ask Money or other magazines). Indeed, some might see the lack of diversity as highly desirable for both defensible (wanting a higher quality of life – isn’t that what the suburbs are supposed to be about?) and indefensible (trying to avoid members of a different racial/ethnic groups or certain social classes). The rankings were based on evaluations from 215 cities with populations of more than 100,000 residents and included analysis of the city’s violent and property crime data, including murder, assault, robbery, burglary, larceny and vehicle theft rates. Niche, a Pittsburgh-based ranking and review web site, used the 2013 FBI Uniform Crime Report “Crime in the United States,” an annual publication that reports the number and rate of violent and property crime offenses. They then used a formula to determine the city’s safety ranking, which includes weighting the crime by category: murder rate at 30 percent; assault and robbery at 20 percent each; and burglary and larceny at 10 percent each. Two Naperville officials are quoted in the story praising crime prevention efforts. This helps but my guess regarding the bigger factor is the wealth of the community. According to the latest (2013) Census estimates: Naperville has a median household income of $108,302, the poverty rate is 4.1%, and the percent of residents with a high school degree is 96.5% and 65.9% have a bachelor’s degree. There are plenty of wealthy communities in the United States but they tend to be smaller. Once you get cities bigger than 100,000, it is hard to find many that have the number of educated and wealthy residents as Naperville.